Are You Free From Your Mind? TapasYogi Nandhi Tells You! The energy to keep up with these everyday activities could be used for something a lot more productive instead. 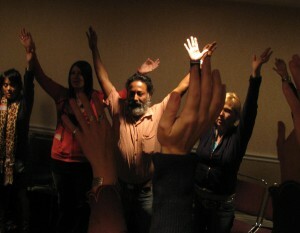 Like…closing the gap, paying attention to You, The Very One who you really are, Your Essence, Your Core, which is Divine! We are lucky now to be living in a time when the world is starting to realize that there is more to human achievement than material success and social prestige. As a result, more and more people have set out on a transformational journey, not only in the United States, but also around the world. We now have a variety of truly significant paths available to us through Gurus and teachers, whose mission in life is to help those of us who are searching to reach more evolved states of consciousness; bringing us to enlightenment and helping us reach a state of peace. “For many people what’s missing can be described as contentedness and peace! Not only energetically, but also as functional human beings,” Yogi Nandhi says, one who is enlightened by the Source so that we might awake! Nandhi’s personal mission to individual enlightenment began as a young boy of four in India, when, on a Pilgrimige with his father, they heard the roar of a tiger in the forest. As he was carried on his father’s shoulders, he became aware of a radiant being, a ray of light, a “lamp” that showed them the way out of the forest and away from danger. Nandhi recognized this “lamp” as a higher power, and it became something he carried with him, a friend who was always there to assure and comfort him during the hard times he often enduring growing up. After his schooling and studies in England, Nandhi started a granite business in India, and in less than four years the company became one of the largest in that industry, with hundreds of employees. But despite his financial success, Nandhi still felt something was lacking, that business was not his real purpose in life. At the age of 24, as he was praying he heard a voice saying, “I have come to take you.” He began to feel death approach him. A young saint, whom Nandhi had never met before, knocked on his door. He told Nandhi that Nandhi’s karmic death had come and he had been sent to take Nandhi through the process. Without any hesitation, Nandhi followed him into the forest, actually in joy knowing that soon he would connect back to his ancient past. The saint initiated Nandhi into the Siddhar path (where all the branches of ancient wisdom – medicine, prayer rituals and meditation, hatha yoga and Vedic studies come together) after taking Nandhi through a death-like process. From this moment on, Nandhi knew that he was awakened and his true purpose of having been born in India revealed itself. Now, as he began living a transformed life, Nandhi took his plunge into the ‘other’ India, seeking at first the enlightened masters, the Gurus, the Siddhar yogis. 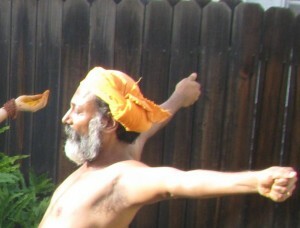 The Siddhar are yogis journeying beyond “enlightenment,” into the “I am” experience. Nandhi was fortunate to find that he had these Sages literally waiting for him! 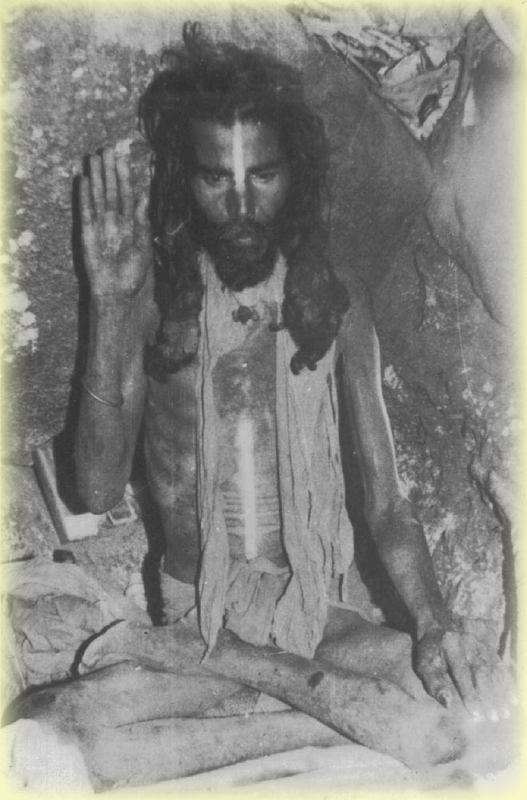 His Siddhar Gurus took Nandhi through the spiritual wilderness of caves and ancient spiritual centers that have been secretive for thousands of years and still are. He spent more than a decade meditating in the caves and in pilgrimages in the company of these enlightened masters as a saddhu, or wandering yogi. It was through this inner journey beyond awakening that Nandhi realized his life purpose included his childhood vision – to save the lives of thousands of retired animals, while reclaiming vast thorn wastelands and converting it to biodynamic agricultural land with the intent of sharing one-third of the vast agricultural land’s vegetarian produce with the hungry. The object of this vision offered compassion on a large scale to elderly animals until their natural death while being able to feed thousands healthy vegetarian food. The Vision continue to unfold! The land that has been acquired in Mukkudal, India, is now developing into an ecological reserve and community, participating in a grand dharma of saving thousands of cows, while also providing the organic material to fertilize and create bio-dynamic farms that can feed thousands of people with nutritious vegetarian food, as it nourishes Mother Earth and uplifts the bodies and spirits of those who benefit from it. “And, when the animal passed away of natural causes, we have the world’s only supply of cruelty-free leather,” Nandhi says. Nandhi also began to have visions of his future and past lives, and realized that he had been from the West in a previous lifetime, and he felt his mission would call him to the area again. 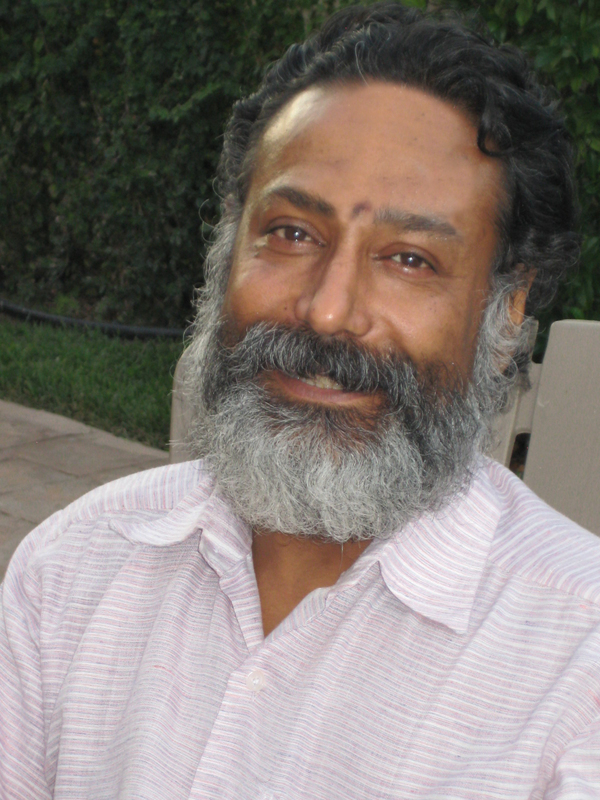 Shortly after his meeting with Amma, he was told by one of his Gurus that his “Kali” lived in California, and six months later he received an e-mail with the subject title, “Hi, I am Kali from California.” He is today married to Kali, Najla, and settled in Santa Monica, California, where the buildings and places are the same images that had appeared as flashes through his meditations in the caves in India. On a recent visit we were graciously received as sacred souls, and offered spiritual wisdom and refreshments. 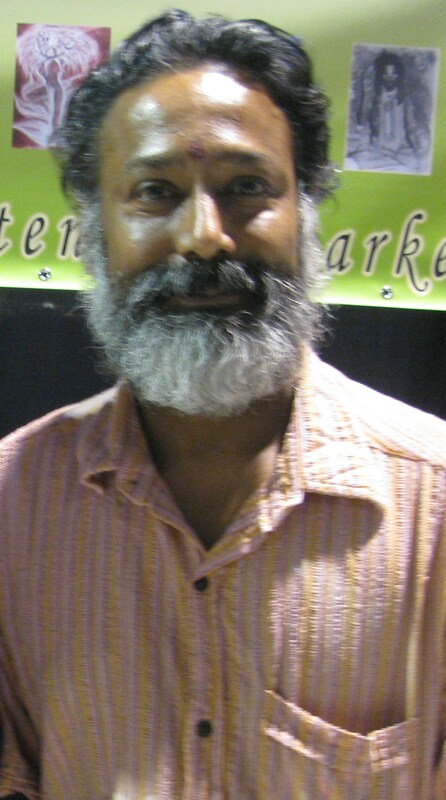 Nandhi is a humble, unassuming man, who never uses the word “I,” and his enthusiasm for higher spiritual values is contagious. Sitting with him, he will expand on many different ideas and values, from Mother Nature to diet, and onto the quest for one’s true purpose in live, and our ultimate search for the true source of all things, and God. There are things he tells us that are not to be believed, but they become real as he describes them not only as experiences, but also as guidance to the power we have all been given. Do we know it? No, generally, we do not! He teaches us! His music, too, is inspired and designed to accompany yoga, meditation, relaxation and healing massages. After coming to the U.S., Nandhi’s Gurus would often appear in his meditation and insist that Nandhi shares their blessings to the world as powerful mantra chants. Nandhi set a precondition- to include the didgeridoo within his music as he felt that it was the only instrument that could accompany the powerful resonant chant. The next week, a didgeridoo master appeared for his yoga teachings and within a very short time, his first music album, “Cave of the Siddhars,” was produced. This music has been calibrated utilizing Dr. David Hawkin’s kinesiology scales and exceeds the known limits of enlightenment. To learn more of Nandhi and his teachings of the mystical yoga of the Sages, Kalangi Kundalini Yoga local classes and workshops please visit: www.nandhi.com; Phone: 310-451-7377; E-mail: vasini@nandhi.com. About the Author of This Article: Lady Adrienne Papp is a recognized journalist who has written for many publications including Savoir, Beverly Hills 90210, Malibu Beach, Santa Monica Sun, The Beverly Hills Times, Brentwood News, Bel-Air View, Celebrity Society, Celeb Staff, It Magazine, Chic Today, LA2DAY, West Side Today among many others. She is the President and CEO of Los Angeles / New York-based publicity company, Atlantic Publicity and publishing house, Atlantic Publisher. Adrienne writes about world trends, Quantum Physics, entertainment and interviews celebrities, world leaders, inventors, philanthropists and entrepreneurs. She also owns Atlantic United Films that produces and finances true stories made for theatrical release or the silver screen. Spotlight News Magazine is owned by Atlantic United, Incwith Adrienne Pappbeing the majority shareholder.